Written in 1956 when Morocco and Tunisia gained independence from France and soon after the Algerian war had started, this book describes the inescapable bonds between colonizer and colonized. Born in Tunis, Memmi is one of the colonized, but as a Jew, he identified culturally with the colonizer. 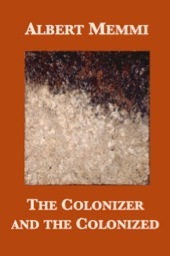 He moved to France in 1956 and draws on his experience to analyze vividly how colonizer and colonized are mutually dependent, and ultimately both victims of colonialism.